Your art in 500 grado boxes, and more. We’re back with our friends at FiftyThree to do a special giveaway that’s a little different than usual. FiftyThree has created three prompts for everyone to expand upon, and the selected artist will not only receive a Grado SR225e and FiftyThree Pencil, but also a 24×36 inch print of their art, and a limited edition bio/artwork card placed in 500 Grado boxes. That’s something we’ve never done before, but we’re happy to help give your artwork the exposure that it deserves. The idea for a Grado Artist Series has been in the works for a while now and it makes sense that our first one is in partnership with FiftyThree, creators of the award winning iPad & iPhone app, Paper. To enter the giveaway: download the free Paper app from the App Store and remix one of the three prompts on our Grado profile page of the Public Stream. If this is your first time using Paper, see below for more details and screenshots of how to enter. Entry will be available between November 16th, 2015 through November 25th, 2015. See the full contest details at the bottom of this page. We know this is different than the usual giveaways we do, so if you have any further questions feel free to ask us over at @Grado or @FiftyThree. 1. ELIGIBILITY The Giveaway is open to all Paper members who meet our Terms (13 years of age or older, etc. ), Community Guidelines, and have verified their email address. Employees of FiftyThree and their immediate family members (mother, father, sibling, child) and/or those living in the same household of each are not eligible. Void where prohibited by law. Only one Paper account per person is eligible. Contest is open to entrants worldwide. 2. 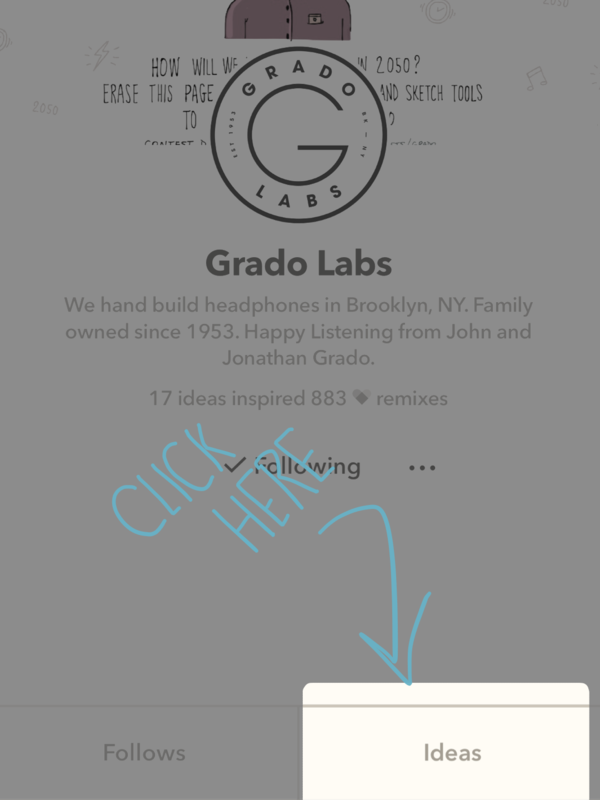 HOW TO ENTER Each entrant can receive up to (3) entries by remixing one of the (3) Grado prompts on the Grado profile page (paper.fiftythree.com/grado) between November 16th, 2015 through November 25th, 2015. 3. GIVEAWAY DRAWING Grado and FiftyThree will select one winner on November 26th from among all eligible entries. Winners must meet all eligibility requirements in order to win. 4. PRIZE and APPROXIMATE RETAIL VALUE One (1) prize will be awarded for the giveaway. The prize includes one (1) FiftyThree Pencil (with an approximate retail value of $59.95), one (1) SR225e Grado Headphone (with an approximate retail value of $200), one (1) 24x36in print of the work that was selected in the giveaway (with an approximate retail value of $40), a printed artist card that will be placed in (500) Grado Headphone boxes to go out during the holidays. All federal, state and local taxes are the sole responsibility of winners. No purchase necessary to enter. 5. ODDS Odds of winning any random drawing will depend on the number of valid entries received during the applicable entry period. Purchasing products from FiftyThree and/or Grado Labs will not increase your chances of winning. 6. WINNER NOTIFICATION Winner will be notified by email. Upon being contacted, winner must provide FiftyThree with their full name and mailing address in order to claim the prize. 7. SPONSOR The Giveaway is sponsored by Grado Labs, 4614 4th Ave, Brooklyn, NY 11220. 8. GENERAL CONDITIONS By participating in this Giveaway, entrants agree to be bound by these rules and the decisions of the judges. Entering from multiple Paper accounts is prohibited. Entrants who are found to have multiple Paper accounts will be disqualified. FiftyThree and Grado reserve the right to cancel, suspend, and/or modify the Giveaway, or any part of it, if any fraud, technical failures, or any other factor beyond FiftyThree’s reasonable control impairs the integrity or proper functioning of the Giveaway, as determined by FiftyThree in its sole discretion. FiftyThree reserves the right, in its sole discretion, to disqualify any entrants it finds to be tampering with the entry process or the operation of the Giveaway or to be acting in violation of these rules or in an unsportsmanlike or disruptive manner. FiftyThree’s failure to enforce any term of these rules will not constitute a waiver of that term.